WKSU was one of the first stations in the nation to adapt HD Radio broadcast technology to its network of stations. Each of WKSU's stations provides a bundle of four program choices from its high-quality, noise free HD Radio digital signal. Contained on the HD1 channel is the station's published program schedule. The HD2 channel delivers WKSU's internationally acclaimed Folk Alley format. A fulltime hosted classical music lineup can be enjoyed on the HD3 channel and the area's unparalleled around-the-clock news service is always available on the HD4 channel. 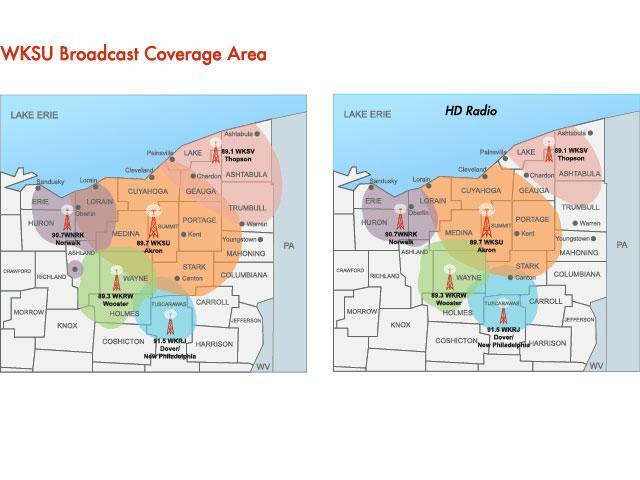 Using an HD Radio requires no additional skill sets other than the listener being located within the primary signal coverage area from any one of WKSU's five stations. Tuning to an HD Radio channel is as easy as first selecting the station's (HD1) channel (89.7 for WKSU, 89.1 for WKSV, 91.5 for WKRJ, 89.3 for WKRW, 90.7 for WNRK.) When landing on that channel, the HD Radio senses the station's HD Radio signal and automatically adapts to that signal within 7-10 seconds. You'll notice the bright, brilliant sound quality difference of digital radio. Most HD Radio capable units will have an HD Radio signal indicator used to assure the radio is tuned to an HD Radio station. Selecting an HD 2, 3, or 4 channel from the station's main HD1 channel is as simple as tuning up the dial one step at a time or, when landed at the HD4 channel, tuning down the dial to descend through the station's HD Radio channels. Remember — it's all free, 24 hours per day, 7 days per week. There is never a subscription charge. An HD Radio capable receiver (radio) is needed to take advantage of this free service. HD Radio units are available in various forms ranging from small portable units that are easily carried when exercising to in-dash units being offered as original equipment from several automobile manufacturers. After-market HD radios are available for car owners who may desire replacement of their existing in-dash radio with an HD Radio capable unit. For home or in-office use, there are several portable, tabletop and high-end receivers available. All HD Radio capable devices typically offer the same features that have been standard on AM-FM radios in the past. HD Radio unit investment requirements typically begin below one-hundred dollars and increase in cost dependent on type, features and quality. 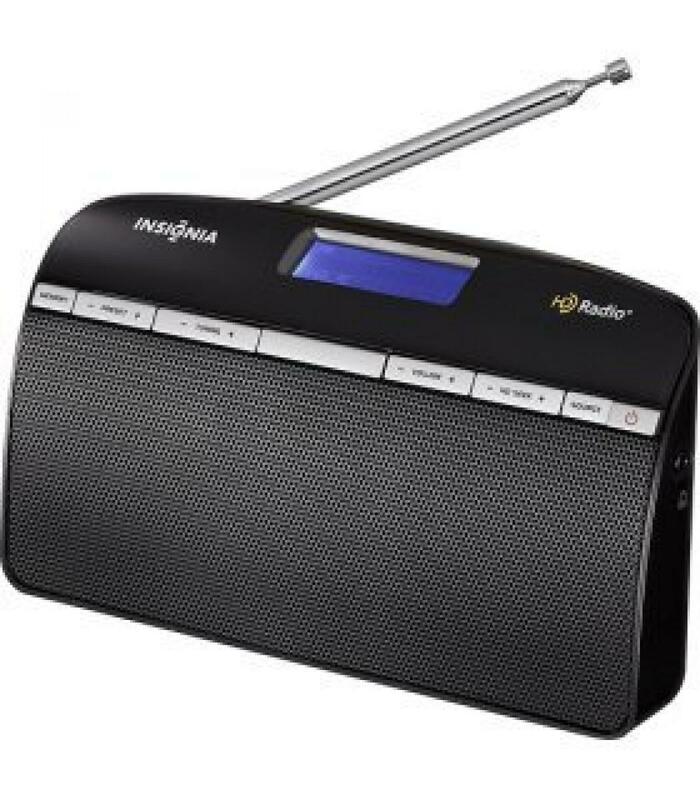 More information about HD Radio and where to purchase HD Radios can be found on this page. As with any new device when purchased, be sure to familiarize yourself with the instructions that come with every HD Radio. 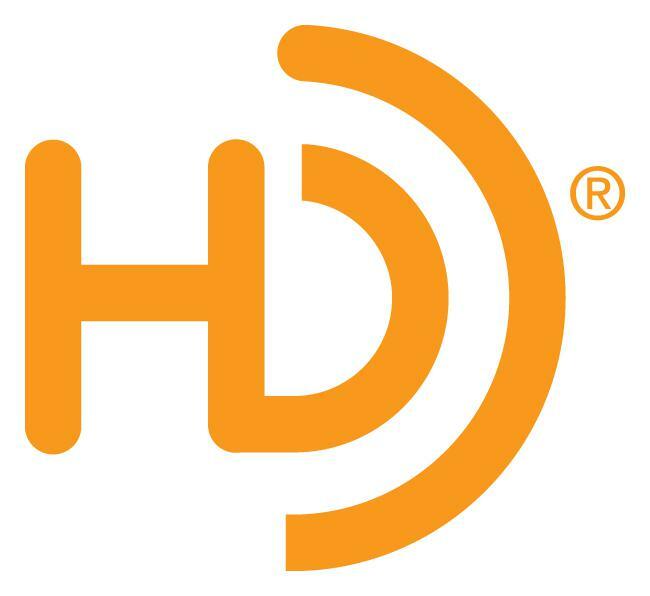 We welcome you to the bright, beautiful sound of HD Radio!